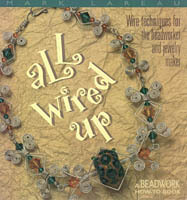 All Wired Up will have you creating unique wirework jewelry in no time. Incredibly detailed, step-by-step instructions are accompanied by more than 260 exquisite line drawings, and together they give every particular necessary for success. Try your hand at a wirewrapped cabochon, then make a necklace using the "the Strongest Wire Hook and Eye Clasp in the Universe". The piece de resistance is a gallery of wirework from twelve contemporary artists, including the author, presented in full-page color photographs. Soft cover, 8.5" x 9", 125 pages. 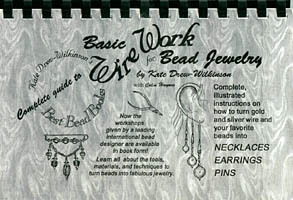 Kate Drew-Wilkinson's "Complete Guide to Basic Wire Work for Bead Jewelry presents the workshop's given by a leading international bead designer in book form. Learn all about the tools, materials and techniques to turn beads into fabulous jewelry. 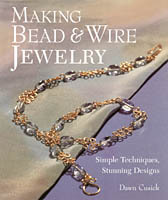 Complete, illustrated instructions on how to turn gold and silver wire and your favorite beads into necklaces, earrings and pins. Soft cover, 8.5" x 6", 91 pages. 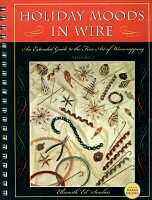 Take your wirework skills beyond the level of jewelry making with author Jane Davis as she provides fresh and creative ideas for using wire to decorate your home, yourself and your favorite things. From the simplicity of a spiral bracelet to embellishing a glass jar, Davis strives to illustrate simple techniques of wirework in hopes of getting others as excited by the possibilities as she is. Presented are a comprehensive overview of basic terms, tools and techniques, 25 jewelry projects including necklaces, bracelets, earrings, rings and pins, 26 home decorating projects including a lampshade, picture frame and boxes. Easy to follow instructions with beautiful color photographs and detailed instructions. Soft cover, 8" x 11", 128 pages. Holiday Moods in Wire introduces a new tool (twister pliers) and a new variety of wire (magnet wire, square and round). 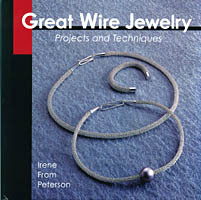 Going through the projects in this book, one notices a new level of wirewrapping beginning to emerge, with as many new horizons to be explored as there are people who have the imagination and the patience to explore them. 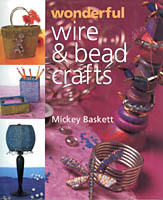 Chapters and projects include Basic Tools for Wirewrapping, Materials, Candy Canes, Mini Tricolor Christmas Trees, Mini Christmas Wreaths, Tree Garlands, Snowflake Tree Garlands, Spiral Icicles, Name Card Holders, Large Birdcage Tree Ornament, Wrap Wire Cover, Wrap Wire cover with Center Post, Angels, Nine Wire Starflakes, Eleven Wire Starflakes, Thirteen wire (Triple) Starflakes, Beadless Starflakes, Crosses and Christmas Tree Balls. Soft cover, wire bound, 8.5" x 11", 160 pages. How to Make Wire Jewelry - Simple but Elegant is written for those who want to get into the fascinating craft of jewelry making but prefer a simpler introduction to creating with expensive metal soldering and casting equipment. This book presents a simple approach requiring a minimum of equipment, tools and supplies. Many intricate designs are possible, yet the technique is easily learned. Projects presented include pins, pendants, chains, necklaces, rings, bracelets, earrings, and more. Soft cover, 8" x 11", 31 pages. In order to teach jewelry making effectively, Ed Soukup developed a system that is both simple and economical - the scroll wire method. With a minimum of low cost tools and some wire it is possible to create designs that although simple, are beautiful. It's all presented in Jewelry Making for Beginners The Scroll Wire Method. In addition to the wire and a few tools all you'll need is some time and patience. With these ingredients you will soon be turning out designs with a professional look. Once you've mastered the technique the possibilities are practically endless. Soft cover, 5.5" x 8.5", 48 pages. Making wire jewelry is easy to learn and fun to do. All it takes is wire, pliers and a few short hours. Before you know it, you'll be twisting, bending, and turning copper, brass, and silver wire into graceful necklaces, exquisite earrings, glittering bracelets, and gleaming rings - more than 60 projects in all. No soldering required! With this clearly illustrated how-to book and some simple, easy-to-find tools, you can create a wardrobe of fabulous handcrafted metal jewelry. Now you can have something to wear with every outfit... or unique handmade gifts for every person on your list. 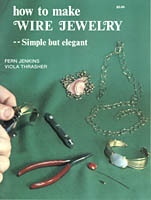 Chapters include An Ancient Design, Experimenting with Heavier Wire, A Simple Chain, Two Sizes of Wire, The Leaf, The Clef, Figure Eights, All angles, Made on a Jig, Triangles, The Wave, "B" Bracelet and Belt, An Expanding Belt, Daisy Chain, 'Round and 'round, Four rings, Buttons and Cuff Links, Clips, Bird Cages, Chain with Pendant, Loop-the-Loop, Colorful Dangles, Triple Pendant, A Few Extras, Variations of the Egyptian, Chains, Adaptations, and New Twists. 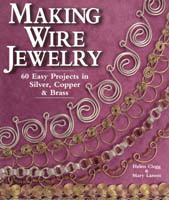 This profusely illustrated book is sure to please anyone wanting to learn to make wire jewelry or expand on their design ideas and jewelry making techniques. Soft cover, 8.5" x 10", 112 pages. Wire recently established itself as one of the most versatile, exciting art and craft mediums around... now it's your turn to have some fun! 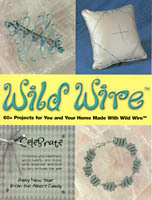 In Wild Wire you'll find complete instructions for bending, shaping, jigging, twisting, spiraling and coiling wire. Presented are more than 60 unique, easy-to-create projects, like necklaces, earrings, bracelets, and embellished table settings and pillows. 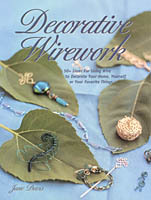 Also included is a special section on using wire to enhance scrapbook pages, journal covers, and greeting cards. Accurate step-by-step instructions, photographs and jig diagrams. Even if you have never worked with wire before you'll be creating amazing looks for yourself and your home in no time! Soft cover, 8.5" x 11", 112 pages. Wire is not boring or still... Wire is alive! Wire has held a fascination as an art and craft medium for many years, but it has only come into the limelight as of late. If you have an interest in wire's rich past or the desire to explore this creative medium, you will find everything you need in this comprehensive volume. Besides discovering how many innovative artists have used wire effectively in their art, you will learn to apply the elements and principles of design to your own art work. 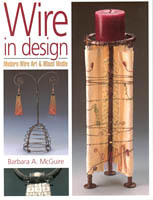 Wire in Design features more than a dozen projects, including jewelry and home decor accessories, a complete guide to basic wire techniques and applications, and showcases the work of more than 75 talented artists. Soft cover, 8" x 11", 144 pages. 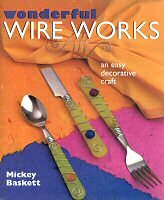 Wonderful Wire and Bead Crafts presents more than 50 shimmering wire and bead projects that are beautiful to wear and that will add a radiant glow to your home and garden. There's something wonderful for everyone and all occasions - treasures and links to cherish, jewelry associated with healing properties, and decorative accents to enhance your decor. Whether it's the glitter of the beads or the sparkle of the wire, you'll find these eye-catching projects impossible to resist. Soft cover, 8.5" x 10", 128 pages. Whether you're making a pin or embellishing a vase, you'll be amazed at how much fun it is to work with versatile, easy-to-manipulate, beautiful wire. You need only a few basic tools to achieve remarkable results on jewelry and a dazzling array of items for home decorating and gift-giving - no soldering is necessary! Look at different types of wire, tools and equipment, and a few simple techniques, then move on to the original projects. Ordinary tabletop accessories become stylish accents that are certain to elevate a meal to a special occasion on the basis of their good looks alone. Use wire and glass cabochons to dress up salt and pepper shakers and transform a colored bottle into an elegant container for serving liqueur. Or add sparkle to goblets by wrapping gold and silver wire studded with beads around the stems. Shine a light on your creativity by putting your talents to work on innovative lamps, lampshades, and candle holders, including a bronze mesh shade set off on a base with silver wire snaking down the pole. And imagine how pretty a ready made frame will look enhanced with coiled and curved wire shapes and iridescent stained glass pieces. There's a design for every setting and occasion. Hard cover, 9" x 10", 128 pages.